Do You Qualify for Social Security Benefits? Do You Qualify for Veterans' Benefits from the VA? Do you Qualify for Both? Social Security claimants who use an attorney are 3x more likely to get benefits. The GAO has found that those who use a representative such as an attorney are at a significant advantage when it comes to securing a favorable ruling. After the VA turned down his claim, David Parker turned to the VFW and the American Legion for help, but they failed. Then he came to Cuddigan Law. When you are a person living with a physical or mental disability, just getting through your life on a day-to-day basis can be a struggle. You should not have to worry about paying your bills and feeding your family, and you certainly shouldn't have to worry about a confusing application for disability benefits or how to appeal a Social Security or VA denial. Going to the local SSA or VA office means having to wait in long lines just to talk to someone. When you call on the phone, there’s another long wait before your call is answered. Improve the chances of your disability application or appeal being approved by utilizing our Veterans benefits and Social Security disability attorneys. Applying For Disability Benefits Can Be Exhausting & Confusing. Let Our Father and Son Team Represent You. 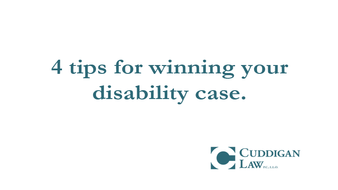 At Cuddigan Law, disability is the only legal area our firm handles. Working with his son Sean Cuddigan , attorney Tim Cuddigan has been strictly devoted to helping thousands of people across Nebraska and Western Iowa with their Social Security needs. We represent Veterans throughout the United States. We serve the Social Security Disability needs of the western Iowa cities of Sioux City, Council Bluffs, Atlanta, Creston, and Shenandoah along with their neighboring communities. We also serve the Social Security needs of Nebraska including the cities of Omaha, Lincoln, Grand Island, Norfolk, Kearney, Nebraska City, Fremont, and the surrounding communities. We stand by your side from your initial application all the way to federal court—or we can jump in if you tried to go it alone and feel you finally need some legal assistance. 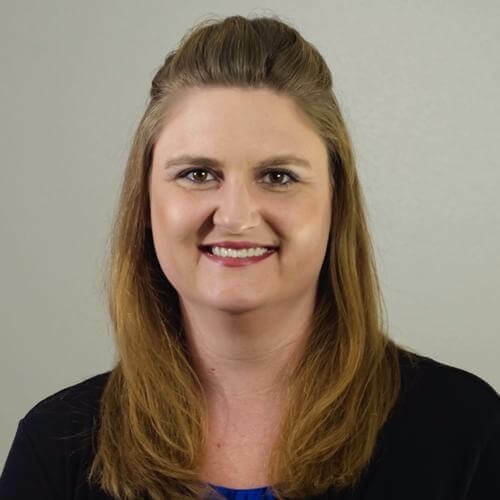 If you've been looking around for the disability lawyer that seems right for you, you may have noticed that some firms don't feel as personal as others...and that's because they aren't. We will give your case the attention it needs and you the respect you deserve. Both the Social Security and the Veterans' Administration conduct their claims process electronically and we are able to help you navigate this process. Do you really want to entrust one of the most important days of your life to someone you've never met, who isn't legally licensed to practice law? Cuddigan Law does not have a call center. From the very beginning, you are considered part of our family and will be treated that way. Applying for disability benefits isn't as easy as filling out a few forms and then receiving your first check. The system is complex and confusing, and the rules are different for Social Security disability than they are for disability for Veterans. Because of that, an overwhelming number of initial applications are denied. The tremendous backlog of VA benefits applications has made national headlines lately, and two out of three first-time Social Security disability claims are denied. We understand how the entire process works and can determine which disability program you may qualify for, fill out your application, gather supporting medical records, work with your doctor and present the best case possible to the Social Security Administration or the VA. The National Organization of Social Security Claimants' Representatives (NOSSCR) is an association of attorneys and other legal advocates who represent applicants for both Social Security Disability Insurance and Supplemental Security Income. Tim Cuddigan is a past president of NOSSCR, and has been a member of their Board of Directors since 2004. With over 40 years of legal experience and over 20 years of focusing his law firm on the representation of Social Security disabled clients, he's uniquely positioned to represent you before the Social Security Administration. In addition to the Cuddigan Law attorneys being sustaining members of National Organization of Social Security Claimants' Representatives, both Tim and Sean have made presentations at the national conferences to educate other Social Security advocates. The National Organization of Veterans’ Advocates is made up of attorneys and other qualified members all united in their dedication to advocating for the disabled Veterans of this nation. Both Sean and Tim Cuddigan have been accredited attorneys by the Veterans Administration since 2008. We represent Veterans throughout the country. If you need help with your disability benefits, we encourage you to give us a call at 402-933-5405 today for a completely free evaluation. Our firm has offices in Omaha and Lincoln, making it easily accessible to individuals from western Iowa to central Nebraska. We are available for phone appointments for those who are unable to travel to our offices in Omaha or Lincoln. 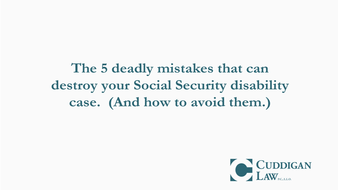 Get your free copy of "5 Deadly Mistakes That Can Destroy Your Social Security Disability Case," written by the Omaha disability attorneys at Cuddigan Law. Are You a Disabled Veteran? Download Your Free Copy of the Essential Guide to VA Disability Claims Before Applying! 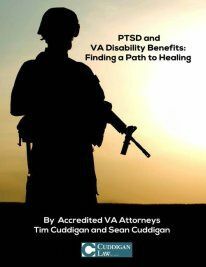 Learn everything you need to know about applying for disability benefits through the VA with this essential, free guide published by Cuddigan Law. Download now! 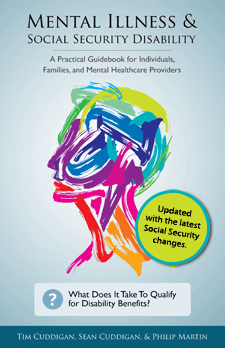 Download this free book today to learn what you need to know about applying for Social Security disability benefits when you suffer from a mental illness. Suffering From Post Traumatic Stress Disorder? You’re Not Alone—Help Is Available. 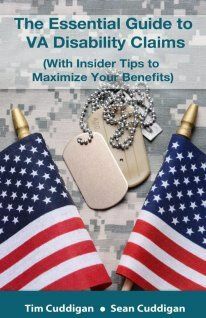 Get Your Free PTSD & VA Disability Benefits Guide. PTSD and VA Disability Benefits: Finding a Path to Healing is your free guide to understanding how to apply—and receive—the benefits you’re entitled to. 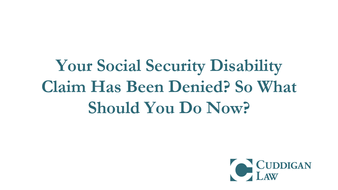 Five Common Mistakes made in the Social Security Disability Process Our free book can teach you how to avoid the most important pitfalls that stand between you and the Social Security Disability benefits you need. Four Tips to Winning Your Social Security Disability Case Most people have their applications for Social Security disability benefits denied. Strategic advice from our attorneys can improve your chances. How Does the VA Claims Process Work? 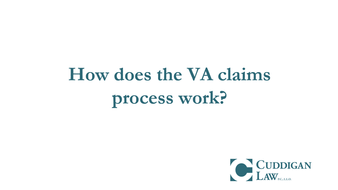 Learn about how filing a claim for veteran's disability benefits with the VA works in this informative video from the disability attorneys at Cuddigan Law. 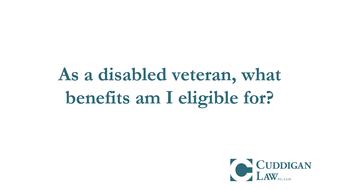 As A Disabled Veteran, What Benefits Am I Eligible For? If you're a disabled veteran, you may qualify for benefits from the VA. Learn more about how you may qualify for veterans compensation benefits here. ?Which Blue Water Navy ships were exposed to Agent Orange? ?Are Blue Water Navy vets eligible for VA benefits? ?Why does the SSA care about work history for my disability claim?